Bruce Campbell will lead the panel and autograph signing session for the third season of his STARZ horror comedy series, ‘Ash vs Evil Dead,’ during New York Comic Con 2017. The title hero of the acclaimed STARZ comedy horror series, ‘Ash vs Evil Dead,’ is set to protect New York Comic Con again this year. The show will host a panel, which will be followed by an autograph signings session. The events for the anticipated third season of the original series will be held on Saturday, October 7. 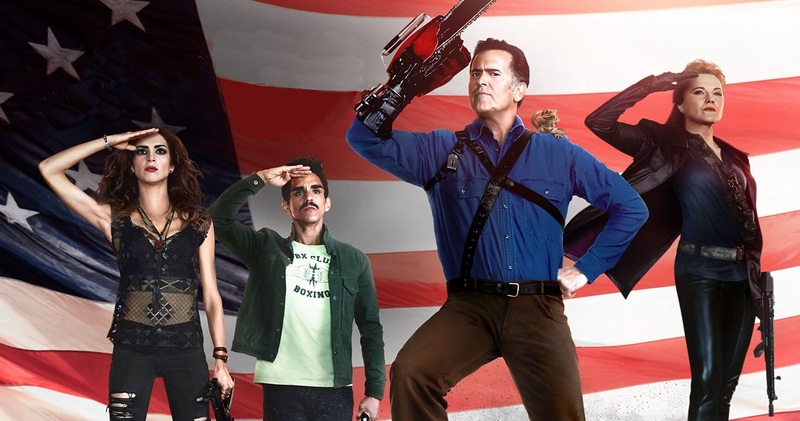 ‘Ash vs Evil Dead’s panel will include executive producer and lead actor, Bruce Campbell, as well several as his co-stars, including Ray Santiago, Dana DeLorenzo, Arielle Carver-O’Neill and Lindsay Farris. The panel will run between 12:30 and 1:30pm at the Hammerstein Ballroom. The autograph signing will then take place between 3 and 4pm at Table 21 in the Autographing Area Hall 1-B at the Javits Convention Center. The third season shows how Ash’s status in Elk Grove, Michigan has changed from murderous urban legend to humanity-saving hometown hero. When Kelly (DeLorenzo) witnesses a televised massacre with Ruby’s (Lucy Lawless) fingerprints all over it, she returns with a new friend to warn Ash and Pablo (Ray Santiago) that evil isn’t done with them yet. Blood is thicker than water in the battle of good vs Evil Dead. During the third season, Ruby will devise her most diabolical plan to defeat Ash and raise hell on earth. Pablo, who will forever be loyal to Ash, will realize his true destiny in the battle against evil. Kelly’s single goal is to kill Ruby and end the Evil Dead torment once and for all. The upcoming season will also feature several new characters, including Brandy Barr (Carver-O’Neill), Ash’s long lost daughter, who’s left in his care when her mother meets an untimely demise. Dalton (Farris) is the leader of an ancient order that’s called the Knights of Sumeria, and who seek Ash to lead their fight against The Dark Ones. Sam Raimi, who wrote and directed ‘The Evil Dead’ film trilogy, also serves as an executive producer on ‘Ash vs Evil Dead,’ which he also co-developed. The action fantasy series’ showrunner, Mark Verheiden, also serves as an executive producer. For more information on ‘Ash vs Evil Dead,’ visit the series’ Facebook and Twitter pages.